A run of three scarce antique Holophane wall lights. A wonderful trio of wall lights with Holophane prismatic glass shades & original galleries with articultaed mounting brackets. 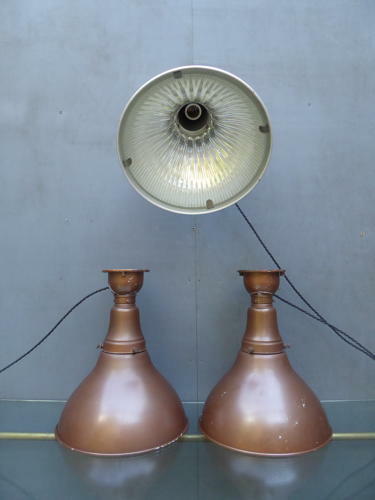 Finished in their original bronze paintwork, they can be used as wall or ceiling lights, can be used with or without the outer metal casing & look fantastic either way. Wired in a generous length of twisted black flex. Price is per light with three available. Wear commensurate with age, all lights are in excellent condition with no damage to the glass shades, all hold position well (position is held & released with a simple twist of the shade) & have expected minor wear to the original paintwork. The lights come rewired & ready for installation though as they are often mains wired, they do not come with plugs or switches. They can be fitted with plugs & switches at cost, please enquire for details. UK shipping available at £15 per light tracked & signed for 24 hour delivery.